Hillsboro plays host to the giddy Indian celebration for a fifth year, as people come from throughout the Northwest to shower each other in dye. 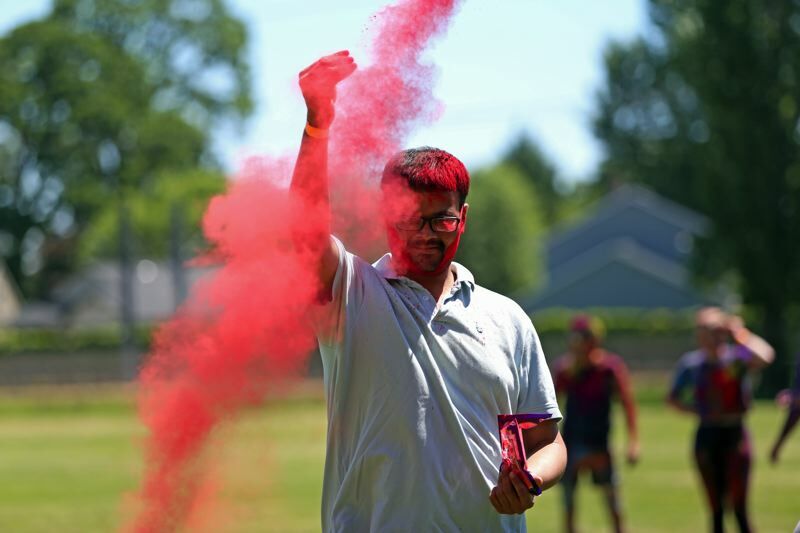 In Hillsboro — situated somewhere between Forest Grove to the west and New Delhi to the east — scores of people came together on Saturday to fling dye, flee, scream and scamper. All in the name of saying "namaste" to spring. The city's fifth Rang Barse, or Festival of Color, kicked off in the city's Fairground Sports Complex. The event — Rang Barse means "shower or color" — celebrates Holi, the traditional Indian spring festival. 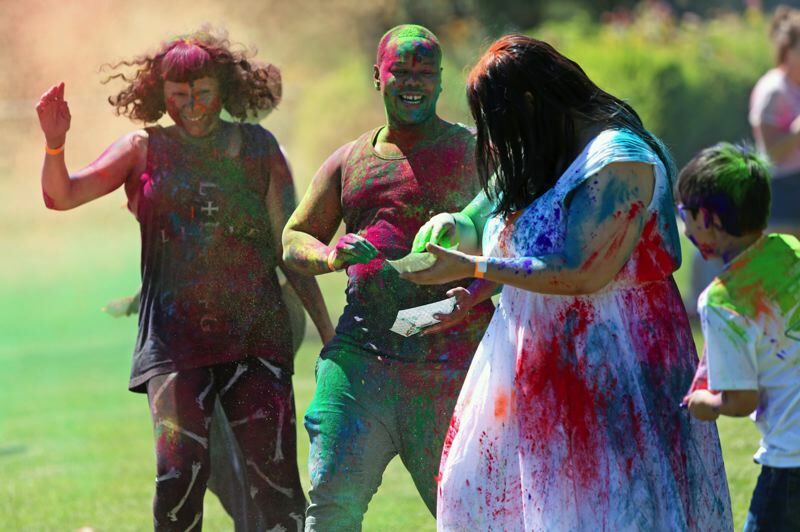 And the primary motivation for most of the celebrants is to cover each other in brightly colored dye sprinkled from bags, or shot from water pistols, or simply floating as great chromatic clouds hovering over the park. "We came last year for my daughter's birthday. It was so much fun, she wanted to come back this year" said Jeannie Hartgreaves of Banks, who then stopped to wipe her tongue. "Yeah. I think I got it in my mouth." If the Indian celebration is unknown to most Americans, Ridhaan Kumar, age 6, is glad to explain it to you. Wearing a super-soaker tank on his back like a Ghostbuster, his hair a cerulean blue, Ridhaan said, "It's all about the colors. It's a lot of fun." When asked why everyone throws colors on each other, he looks at the questioner in surprise. "It's just how you celebrate! Everyone knows that. I mean, I can't do this at school. But today I can!" His father, Rohan Kumar, laughs. "Oh, man, he's been waiting for this day for a month!" Washington County boasts a large and growing Indian population, thanks to major corporations like Intel and Nike, Kumar said, meaning more and more people come into contact with the Indian culture. "Actually, our neighbors do know about the Festival of Color," he said. "The schools have been great about explaining the culture. Parents talk to parents. It's great." Sushmita Poddar started the Hillsboro festival six years ago when a friend, April Pfeiffer, came into Bollywood Movez, Poddar's dance studio. Pfeiffer had just adopted a baby, Alesha Mugdha, in India. And she came to the studio looking for elements of Indian culture to share with her new daughter. "We got talking and, well, this happened," Poddar said on Saturday, hugging Alesha, the now-9-year-old Tobias Elementary School student. When asked why people were pelting each other with dye, Alesha — her braids a lurid purple — just grinned. "I actually don't know." And then threw dye on someone. Nicole Frantilla brought Aedan Kaferly, 10, up from Corvallis for the Holi celebration. They were painting cloth ribbons at a booth sponsored by the Hillsboro Arts and Culture Council, a co-sponsor of the event. "We came up just for this. I mean, why not? This is great!" Brandon Butcher of St. Helens, his face smeared with perfect green and purple handprints, brought his kids, Karston, 16, and Kourtney, 10, to the event as volunteers. "It's super fun, and it's great to learn about another culture," Brandon Butcher said. Moulik Kothari is from Bend. He brought his daughter, Meera, 32 months, to Hillsboro for the day. As Meera cavorted through the park, she left a candy apple red vapor in her wake. "Holi. It's a big deal," he said. 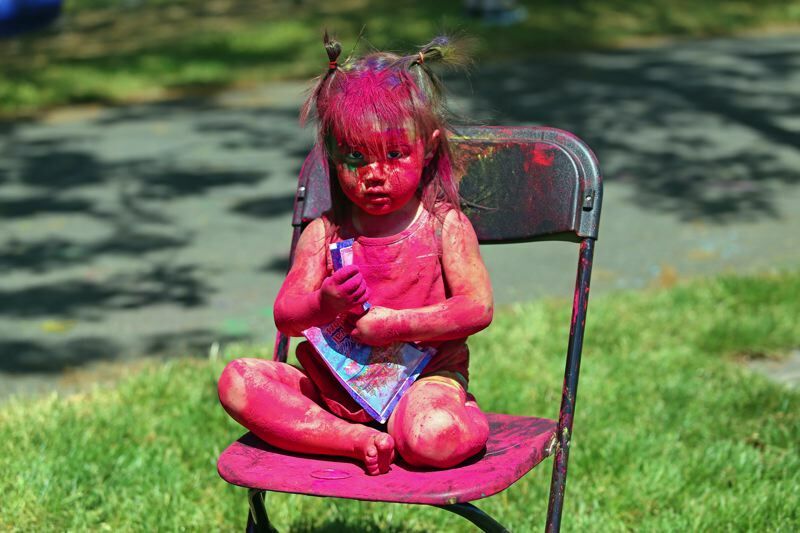 "And this is her first Holi. It's amazing." The actual holiday of Holi is held in March. But, well ... there's March in India and there's March in Oregon. Sushmita Poddar moved the event from March to May after one of the first celebrations ended up cold, rainy and windy. Not ideal weather for water-soluble dye. Jordan Hornaday and Selena Varela came from Portland to dance to the Indian pop music and to take part. "We just wanted to come and have some fun!" Hornaday shouted over the music. "Just to celebrate and spread the love!" As the craziness ensued, Poddar stopped a moment to enjoy the thing she'd created. "This is the one event in which participants make the event. When you see most cultural events, it's as a spectator. There's no watching in Rang Barse," she said, absently reaching out to smear raspberry-tinted dye on the reporter's cheek. But — other than the sheer fun of it — why hurl rainbows at each other? "At first, you can see who's white, who's Indian, who's whatever. But wait! Everyone will get covered. And then, who knows? Everyone's the same," Poddar said. "I'm an artist. Everyone's a canvas. That's the point."